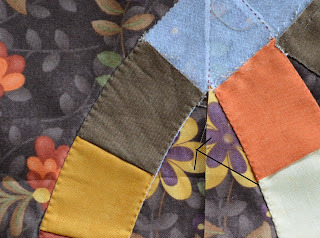 About one year ago I took some classes on how to work with QuiltSmart products. The last class was on double wedding rings. We had to do most of the preparation at home (cut fabrics for the rings using a template, cut background fabrics, jewels, sew interface to rings...). By the time we got to the class we turned rings inside out and learned how to place them onto blocks. When I returned home I decided that instead of making a table runner, I was going to make a 45" x 45" quilt. So, I ordered more fabric and, when it arrived, I put everything inside a zipper bag and on top of the UFO pile. Last weekend, as I am looking for projects I can do without putting too much stress on my left hand, which is still swollen from the MAY 30th surgery ($%@*&!!! ), I came upon this project. I prepared the rings and today I appliqued them onto the background fabrics. You can see the interface at the end of the rings as I have not yet added the jewels to the corners. The machine applique was done with monofilament on both the top thread and in the bobbin, using a very small zigzag stitch. By using monofilament in the bobbin also you will not have to worry about bobbin thread showing on the applique. Perhaps due to my not being able to work with my left hand as usual, I had trouble making sure the interface did not 'peek' out from the back in some of the rings, as you can see on the picture below where the black arrow is pointing to. I will try coloring it with pencil... somehow it will be hidden because otherwise it will not look right! If the background fabric were solid, it would be easier to fix. Since parts of the rings are appliqued onto flowers, hiding the interface will not be an easy task. This whole experience is making me WANT to sew circles... It cannot be as time consuming as 'not sewing them' has been... Look at the other quilts I made using QuiltSmart products (and not sewing curves): the first one is here, and here is the second one. Regardless, this Moda line is beautiful to me. It has all my favorite colors on earth tones. Usually, the fabrics on the double wedding rings are prints and the background is light or solid. I decided to do it the other way around and think it will work. I am not sure I will stop at the rings - I am thinking of adding a border with applique flowers. What do you think? Your quilt will be gorgeous.